Dot Runner: Complete Edition (Intense, £4.50) — This unique puzzle title adopts a dual viewpoint - you see the action from both a top-down perspective as well as a first person view. It's certainly different, but we weren't totally enamoured when we reviewed the North American version back in July. Check out our full Dot Runner: Complete Edition review before downloading. Abyss (EnjoyUp Games, £1.80) — Thanks to its low price point, simple gameplay and fantastically atmospheric soundtrack, this bite-sized download is worth a look - although as you'll see from our Abyss review, it's (ironically) quite a shallow experience, so be warned. Boss Battle (FF12 – BMS). La-Mulana (EnjoyUp Games, 1000 Points) — We saved the best until last. This 2D platform adventure almost never made it to WiiWare, but it's finally here at last, and could well represent the last great download title for Nintendo's ageing console. We'll have a review live as soon as we can, but we imagine most of you have already made your minds up. Not a massive amount of content this week then, but we're willing to bet that La-Mulana's long-delayed arrival will more than make up for that. Are you going to download the epic WiiWare quest? Vote in the poll below! Real Bout Fatal Fury 2 is coming to Europe on 4th October too. I had to do a double take there.Still can't quite believe it! Ice Climber, Balloon Fight, Master of Darkness, Defenders of Oasis, Megaman 1, Megaman 2 - how about some of these Nintendo? There really stands no reason why we couldn't have had a 3DS VC game. La Mulana looks neat. Looking forward to reading the review. La Mulana is more eagerly awaited than Retro City Rampage? I doubt I'll bother with Dot Runner so nothing for me this week. ...Not that I have any money in my bank account anyway. Curse you, Kirby Air Ride for taking the last of my money! Was totally worth it though. Thanks for the LA-MULANA support!!! The game is awesome!!! La-Mulana looks pretty dam sweet from the vid. i just saw for it. I didn't really get a good grip on what the story or what the game was about before to be honest. But the more I look at this game, the more it reminds me of something KONAMI would have made by the way the game looks and plays. That and it reminds me a bit of Castlevania. Happy to see this game land in UK, just hope US don't get screwed over on getting this game like I know they probably will. I would love to play this if it comes out here. 3DSLUIGI: Funny you mention Konami, considering La-Mulana is based on an old Konami game called "Maze of Galious". I'd get La mulana, but I'm stuck in university accommodation, and that means no way to get online on either my wii or 3ds. My wallet is going to hurt at my first holiday break! @sketchturner You spoke for me. Retro City Rampage has been keeping gamers in anticipation since 2010. I wonder how many of the people who voted "Nothing for me this week" are actually from Europe. What does FFS stand for? We have arrived is from Final fantasy Type-0. Does it have a different name in some regions? Anyway, nothing that interests me this week. 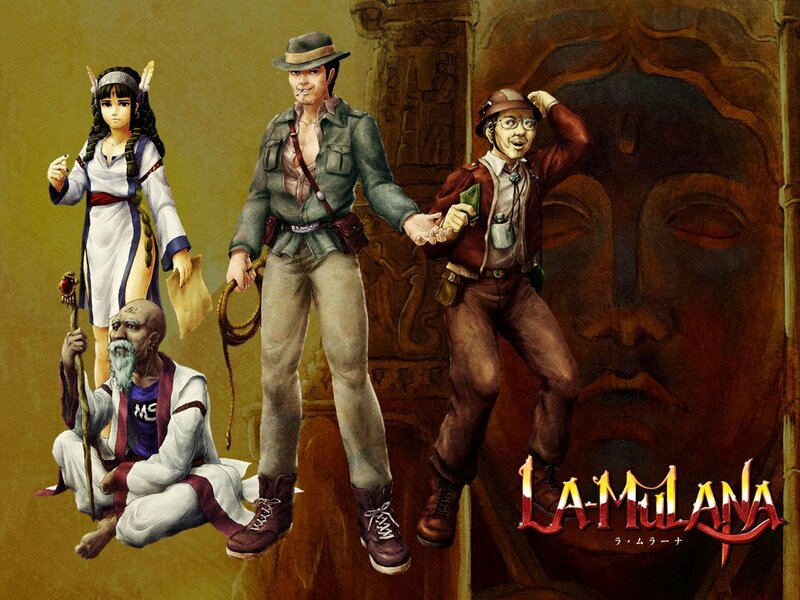 Not interested in La-Mulana but I hope it sells well for more WiiWare games to be released. I don't want this to be the last great download title for Nintendo's ageing console. If La Mulana REALLY gets released this week, then I might buy it soon. 10 Euro, heh! Pfew, I feared it would be more expensive! Does anyone know if the DLC is also coming (the Extra hard dungeon)! Probably not, but you never know! TBH, I don't really know why La-Mulana is being released for WiiWare when it can probably do a heck of a lot better on the 3DS eShop. That or on the upcoming Wii U's eShop when that happens. La-Mulana, finally!! The first game in months I´m going to buy. @3DSLUIGI: It was programmed for WiiWare (and PC) so why should it come to 3DS? You know a wizard? Or have you paid a developer lots of money to port it over? La-Mulana is a pretty massive and ambitious game for a tiny Japanese indie developer with limited resources like Nigoro. Imo, the small 3DS screen and resolution wouldn´t do the game a favor anyway, and I think lots of Wii and especially Wii U users will buy this. Can we please get a full comparison between the PC version of La-Mulana and the WiiWare version? I hope La-Mulana is coming to Canada also cause it looks awesome! @ReaperX30 comes out the same week. Hmm... No 3DS VC this week, but that gives me a chance to catch up on my backlog of games. Not interested in the Dot Runner game, i did d/l Picdun but found it really tedious. For Australian gamers, Inchworm Animation (DSiWare) has finally been released in the eShop and DSiWare shop and it'll set you back 500 Nintendo points (AU$7.50). Why is this La Mulana game coming to Europe and North America Simultaneously? This confuses and angers me. Why didn't we have to wait six months? Oh... Nicalis weren't publishing this one. @3DSLUIGI You do know that all WiiWare games will be available to download on Wii U too. I didn't get a DSi so I missed out on all the DSiWare games until I got my 3DS and then set about catching up on what I had missed. I assume that Wii U owners will do the same with WiiWare games too. @FonistofCruxis 'FFS' stands for Final Fantasy Series, a title given to the songs that are not from the main series, like XIII-2, Type-0 and Versus XIII.